"Lisa's fascination with organization began at an early age when she categorized the dolls and drawing supplies in her childhood room. That eventually led to reorganizing her clothes by length, type and color, and as an adult, she parlayed this talent into her first full-time closet organization job in 1986. 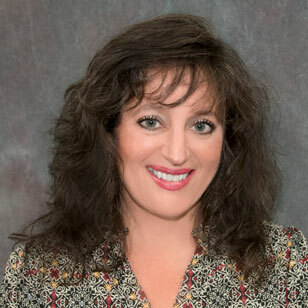 A mother of three artistic, creative children, Lisa has also organized kitchens, home-schooled her kids and dabbled in office work. Her passion remains organizing home interior spaces and creating peaceful, tranquil places." 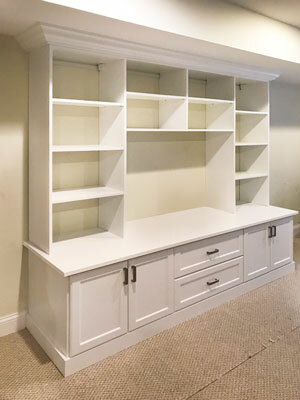 A basement remodel opened up the perfect opportunity to create an "apparel annex," or space for additional clothing outside of the owner's professional wardrobe that was kept in the master bedroom closet. 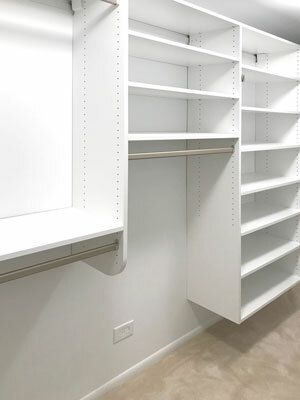 The narrow space has been maximized to store tons of clothes with suspended hanging and shelving in addition to a 360 Shoe Spinner for perfect closet corner storage. This closet design is a great example on how even a narrow space can be maximized and transformed into a haven for your wardrobe. The design includes hanging, shelving, and even a corner Shoe Spinner to organize each and every pair of shoes. 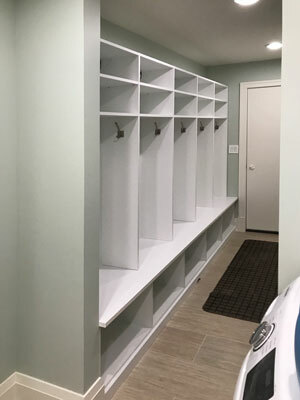 A simple basement remodel allowed for Lisa to design this organization-packed walk-in closet as a way for her client to easily manage her entire wardrobe. 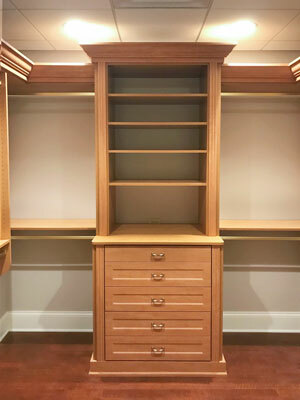 As part of a modest home, the basement offered additional space that was transformed into the master walk-in closet this couple had always dreamed of. 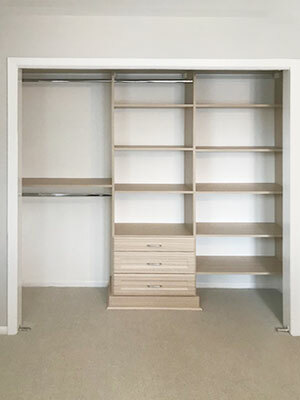 The grand space offers multiple organization solutions including clever corner hanging in each corner, expansive shelving, and closet hutches to display precious items. 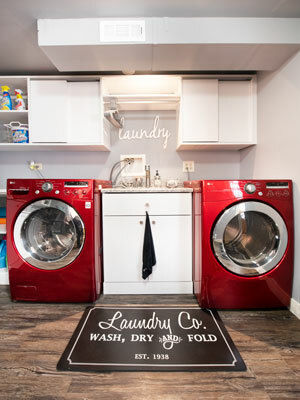 The beautiful basement renovation doesn't stop at just storage systems for hanging and folded clothing. An entire wall is dedicated to storage for a glorious amount of shoes. 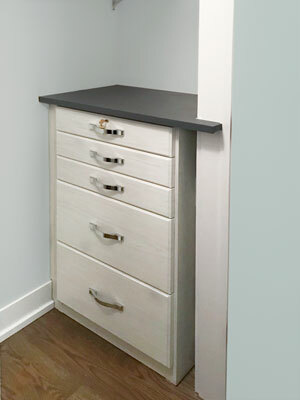 The unit includes a convenient closet hutch in the center for loose garments and storage of accessories. 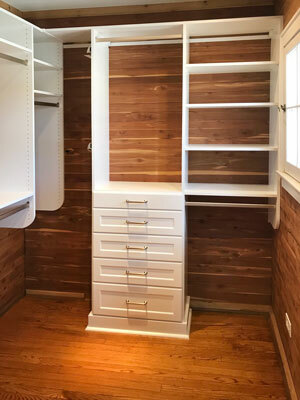 Lisa designed this elegant closet in white with Emerald style handles and Aspen fronts as a way to add organization but also reflect the beauty of the cedar walls. The design offers plenty of hanging, shelving, and also drawer storage space. 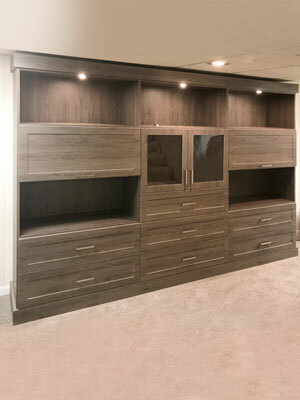 A soft, River Rock laminate is used as an accent in this walk in closet system — bringing forth an elegant touch of nature. The exquisite style choices along with the construction details make this a stand out design. As a suspended system, the unit offers additional storage both above and below the structural components. 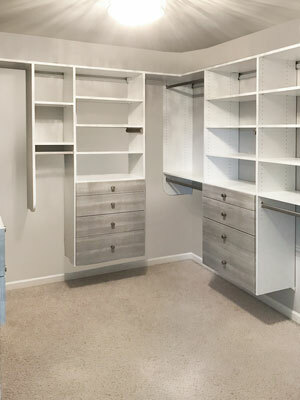 This reach-in closet was designed as a closet for an office and guest room. 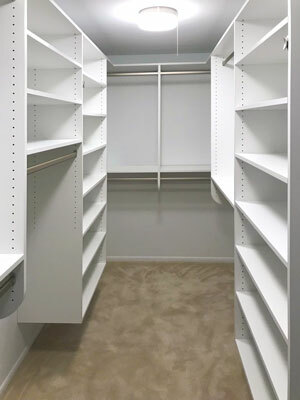 An organization system like this can offer much needed storage space for seasonal and miscellaneous storage. The design is in a light Summer Breeze laminate with Standard chrome handles. Built into an alcove in the wall, this bedroom wardrobe is a beautiful display of precision and elegance. The expansive unit has been constructed to fit seamlessly within the wall's constraints by using scribe filler and scribe moulding to even out the provided space and work with the client's existing crown moulding. An irregular, angling wall presented a design challenge that was overcome by creating an isolated hanging component to make perfect use of the space. 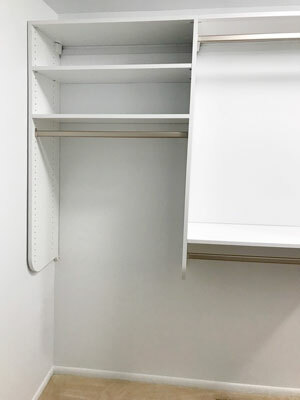 To boost organization in this separate space even further, a telescoping tie rack and belt rack have been added to the system. Narrow spaces require careful consideration of how to create a roomy, uncramped space while maximizing storage capacity. 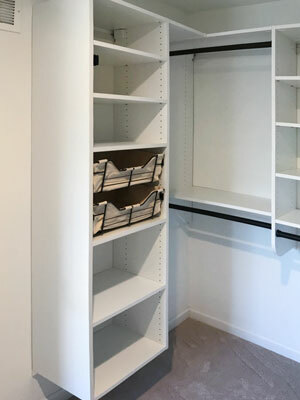 This walk in closet offers extensive shelving and hanging that span the walls and create an alcove on the back wall exclusively for double hanging rods. By using a white laminate, the brightness of the organization system visually expands the space. 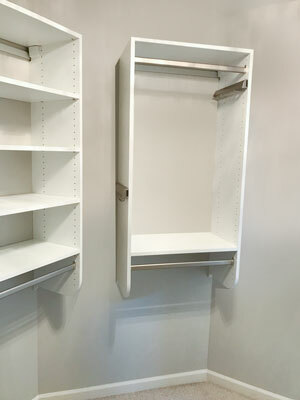 The benefits of a customized walk in closet are rewarding for personal wardrobe storage needs. Different length hanging sections offer in-depth organization of particular clothing items such as separating slacks from lightweight blouses. Closet shelves provide the perfect place to keep folded sweaters. As a suspended system, this walk in closet is built with extremely strong components that carpet easily runs underneath — also leaving clear access to electrical outlets. Generous shelving is provided for all shoes and folded items whereas diverse hanging compartments offer space for different length garments. 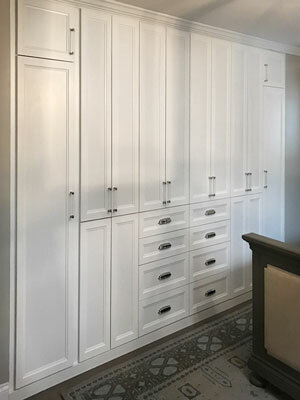 This master walk in closet has pillowed Italia drawer faces for a tranquil, soft look in combination with quiet and delicate Round brushed chrome knobs. The drawers vary in depth for diverse storage including undergarments, socks, pajamas, and more. Keeping things easygoing, this walk in closet has a charm with the added bonus of canvas lined baskets — perfect for holding socks, underwear, and other loose items. The oil rubbed bronze rods and baskets create a pleasant contrast with the white suspended closet system. 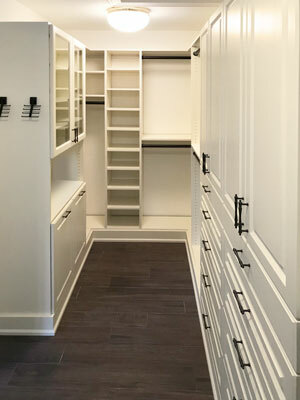 This master walk in closet system is mixed — a combination of floor-based and suspended. The system does not extend all the way to the ceiling and leaves room for overhead storage and also allows the decorative, floral wallpaper to stand out. 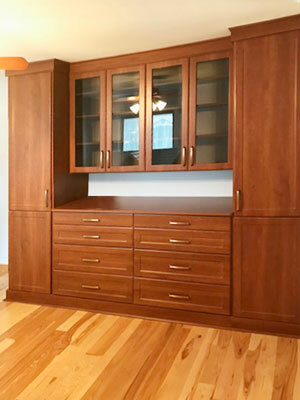 The unit includes a closet hutch with a Vintage countertop for an elegant contrast. 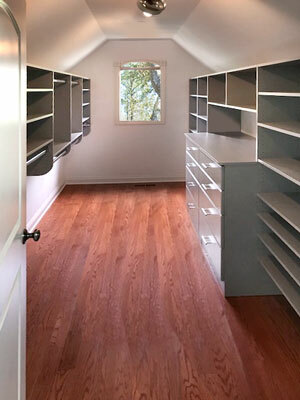 This walk in closet is a master his-and-hers design in a calming Rain Cloud laminate. The cool gray laminate offers a soft variance to the illuminated white room. As an irregular space, the slanted ceilings presented a challenge overcome by Lisa's ease in creating a design to maximize organization along the walls. Classic beauty in combination with stylish accents create this closet into a masterpiece. The ivory laminate, harmony doors, oil rubbed bronze Monarch handles, and glass inserts are all traditional elements to complete the elegant and charming design. This walk in closet is masterfully designed using a Tafisa Candlelight laminate with brass accents. The design emanates a warmth with its matte brass rods and Champagne bronze hardware. Regal doors and traditional crown moulding complete the elegant look that's simply glowing with organization. A section of the original basement laundry room was sectioned off to make a dedicated pantry area for food and small appliance storage to accommodate this modern amateur chef's kitchen storage needs. 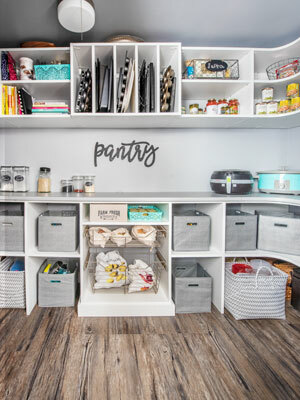 The design includes a variety of pantry accessories and customizations including vertical tray dividers, open curved shelving, pull-out baskets, and an expansive rounded countertop. 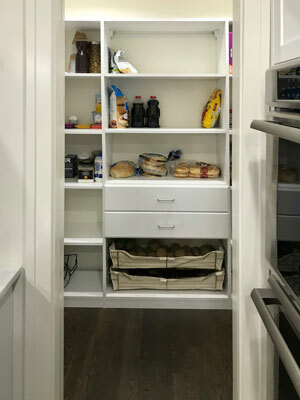 This small walk in pantry has been customized to make full use of the available space including intersecting corner pantry shelves, canvas-lined baskets, and drawers for utensils. The expansive shelves maximize pantry storage space to ensure nothing will get lost in the mix and always be easily accessible. 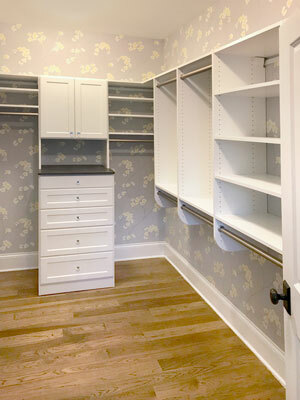 Pantry organization is made simple in this walk in closet with drawers, spacious shelves, and pull-out baskets. Canvas baskets are a great way to store dry vegetables and add an accent of textured material to in an all-white pantry. This reach in closet is a great example displaying the versatility of Closet Works organization systems. 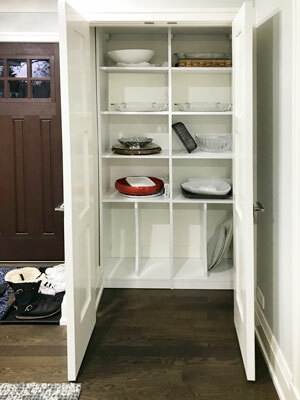 With a simple grid-like arrangement of shelves and vertical dividers, fragile dishes and dinnerware can have a proper storage place in the home. 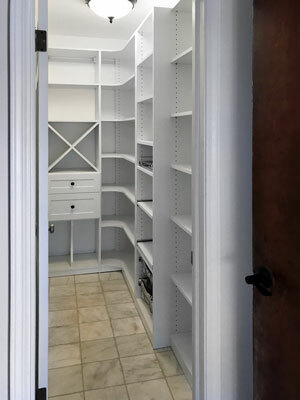 This walk in pantry is customized for all sorts of organization! This arrangement includes a wine cube to hold a collection of bottles, corner pantry shelving, wire baskets, and pull-out shelves. 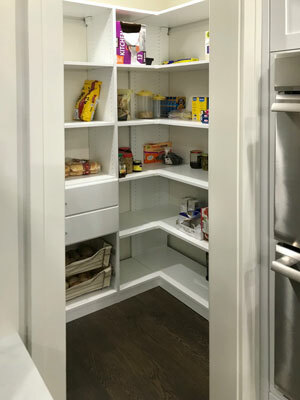 This walk in design creates an eclectic space and provides more efficient storage with its details for specialized pantry organization. 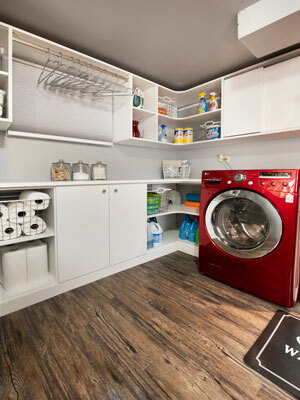 This laundry room has been designed to perfection with plenty of storage space with curved shelving, sliding cabinet doors, a custom sink cabinet, and plenty more features to transform this space into a stress-free zone. 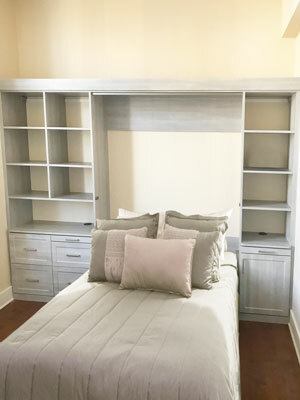 The homeowner had a modern vision with creative déor that Lisa was able to keep in mind while she designed this space to meet every organizational need. In this modern design, the old utility sink was replaced by a new sink with a custom cabinet. The simple white and gray palette that made the client’s red appliances pop, focusing attention on that lively color. A challenge of this project included working in a basement with low ceilings and lots of exposed ductwork where large air vents for the home’s HVAC system were hanging from the ceiling, restricting access to some of the walls. We optimized the space and worked around the ductwork in the ceiling by using sliding doors on the cabinets above the appliances. This mudroom design is a charming and simple design to keep an entire family organized. With four hooks in each nook, each family member can have a designated spot for their jackets, backpacks, hats and more. Additional outerwear and accessories can be stored on the spacious shelves and shoes can be stored below. The base of the unit is outfitted with an arched opening to leave access for the vent. This wall unit makes clean-up a walk in the park, becoming not only a storage hub but also an entertainment center for the entire family to relax around. The expansive white design has Aspen door faces and brushed chrome Metro handles. This design is outstanding on every level including the natural Blackwood laminate choice, smoked glass inserts, unique layout of cabinet doors, custom LED lighting — features to complete the overall regal look of the basement entertainment center. In a Corretto Cherry laminate with Aspen fronts, this design has a sophistication that is transformational for this home office. The design has a natural warmth from the Corretto Cherry laminate in addition to the matte Gold Novel handles and frosted glass cabinets that give the design added charm and elegance. This home office design is stylish and sleek — offering the perfect work space with a custom desktop and office cabinets. The countertop is Moonlight laminate that contrasts elegantly with the premium Winter Fun! system creating a relaxing environment. Chrome Strap handles are a classy and outstanding accent to the design. 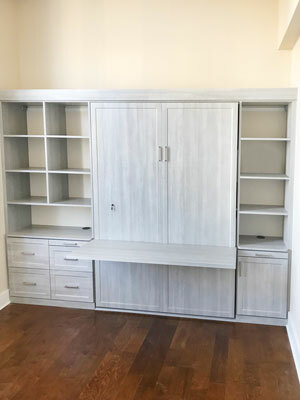 As an elaborate section of the home office design, this wall unit provides further storage and is an elegant counterpart — fitting perfectly beside the expansive window. Office supplies and decor can be displayed on the sophisticated shelves and stand out against the light, Winter Fun! shelves. 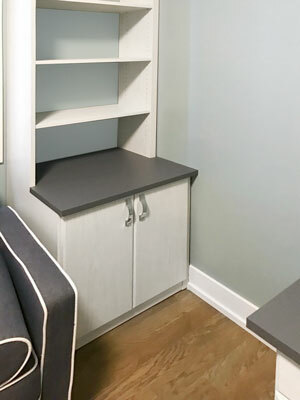 This nook of the home office serves as a closet with drawer storage for important paperwork and secured belongings. Two of the large drawers are file organizers whereas the top drawer offers a lock to keep valuable items extra safe. This elegant wall bed project has been designed in a calming River Rock laminate, fitting a full-size comfortable bed. 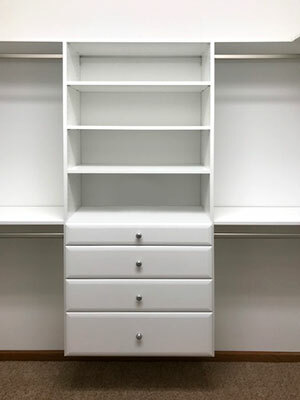 The design has convenience built into it including two pull-out bedside trays, file drawers for office storage, and even a built-in desk when it is folded up. Wires can easily pass through the unit too by the use of grommet holes. In addition to the sophistication and comfort this design offers, the wall bed has a built-in desk to transform this space into a multipurpose zone. 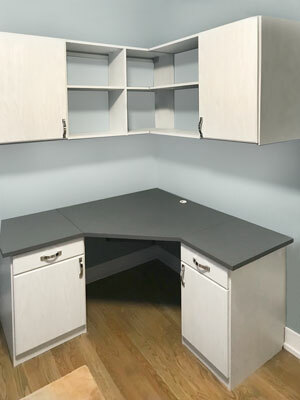 To facilitate working at the murphy desk, file drawers have been included along with pull-outs for additional counterspace to place your things. The River Rock laminate with Moderne handles creates a calming, modern, and decorative piece for this guest room.